You can time travel in the TARDIS by using the controls on the TARDIS console. There are multiple repeaters in your TARDIS, and each has its own function. The repeater closest to the door controls the environment type of the world you will travel to. Note: Going to other types of world may require more Artron Energy. 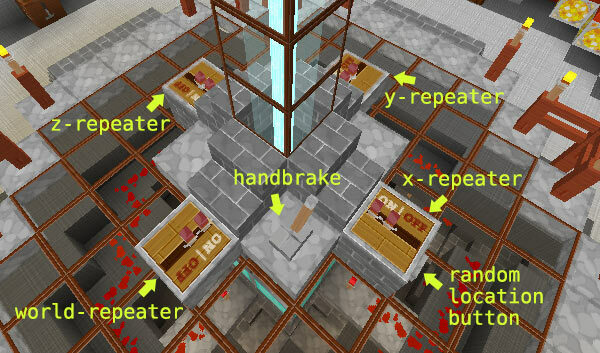 With your back to the door, the left and right repeaters control the Z and X coordinates respectively. The longer the delay/larger the gap on the repeaters = a greater distance. The farthest repeater from the door is a multiplier for distance traveled. The same rule as the longer delay from above applies here as well. To travel to a random destination, set the repeaters to your desired settings. Your TARDIS comes equipped with a stone button & a handbrake (lever). The stone button “sets” your destination to a random location with respect to the repeater settings from the section above, and the handbrake initiates travel and parks your TARDIS. Click the stone button and your TARDIS will lock on to a destination. Disengage the handbrake by RIGHT-clicking it. Once the TARDIS has finished navigating the time vortex (see flight modes), LEFT-click the handbrake to park (best not to be in creative mode!). To exit the TARDIS simply RIGHT-click on the iron door with your TARDIS key and you will exit at your destination. If the TARDIS difficulty level is set to medium or hard, you’ll want to get to know your Advanced Console — find out more on the Advanced Console page. You can find these on the Travel Commands page. Use an inventory based GUI to set your destination. See more on the Save Sign and Destination Terminal pages.